The well-educated daughter of a lawyer, Trudy Bauer arrives at the St. Louis based Mail-Order Brides of the West agency full of excitement for an adventure of a lifetime. She befriends the agency’s maid, Evie Davenport, and the two form a strong and lasting friendship. They vow to stay in contact through letters when Evie takes hold of her destiny and arranges a marriage on the sly. Each brave young woman is ready to face whatever an unknown groom and life in Montana can throw her way. 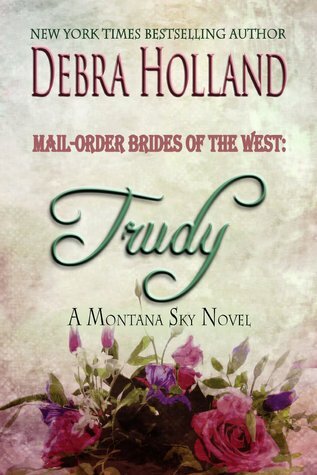 In Holland’s book, bride-to-be Trudy Bauer rides the train to Sweetwater Springs, in a Montana Sky Novel. In Fyffe’s novel, house servant Evie Davenport travels by stagecoach to Y Knot, Montana in a McCutcheon Family Novel. Through their correspondence, the friends keep each other abreast of their hardships, trials, and tribulations – some of heartbreak, some of love. by Debra Holland is an interesting America Western Historical Romance set in Sweetwater Springs, Montana. What an intriguing beginning of what is going to be an interesting series. I enjoy mail-order brides immensely and Trudy was delightful in more ways than one. The narrator was easy to listen to, very dramatic, and entertaining. 6 + hours of pure entertainment. Well done! The characters are engaging, the storyline interesting. I look forward to the next installment of the delightful tale of romance and love. What a sweet and tender love story!